Colour is the essence of life, and it can affect everyone in one way or another. So how about being able to control that through the use of light and colour in your own home? Philips has been focusing on technology that can bring a positive change to your life. LivingColor is one of those products that falls in to this noble cause as it helps to create a more healthy environment for you to live and work in. 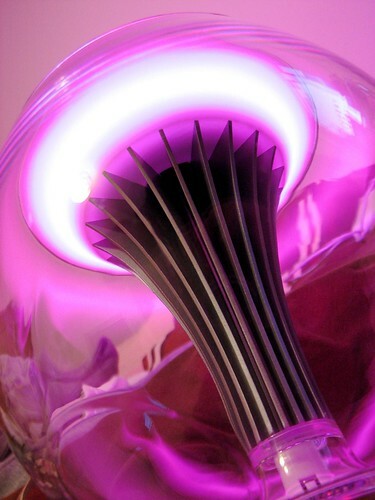 The LivingColors lamp contains four LED lights which combine to shine a whole spectrum of mood-changing colours. You may be familiar with it from their range of Ambilight televisions, providing a similar colour system to complement what’s on your display. In its simplest form, you’re looking at a stylish lamp that can sit on the floor and shines a light on to your wall or furniture. The mood lighting that this creates can be tailored to the environment you’re in and create a peace that otherwise wouldn’t be possible. If it’s a bit dark and damp today, why not inject some sunlight yellow in to the room and make yourself feel happier. Design is more important than ever for technology and none more so than products that sit in the living room where they’re out on show. 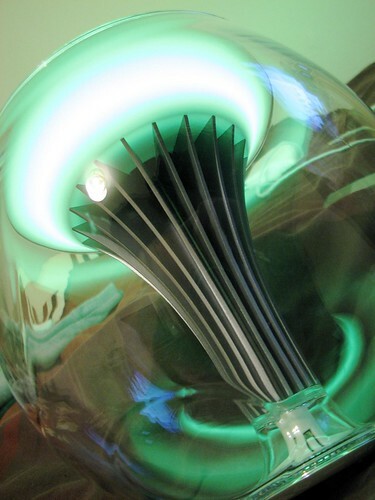 The designers behind the LivingColor system have created what appears to be a translucent glass lamp that showcases the beautiful LED light system. I found the design to be intriguing, almost like another piece of furniture in itself. Simplicity seems to be the key here, since there are no switches or dials on the main unit, simply plug and play. The included remote is designed to work very simply. It responds via touch and has a scroll wheel not that different to what you find on an iPod. This is used to select and move through the entire spectrum of colours. 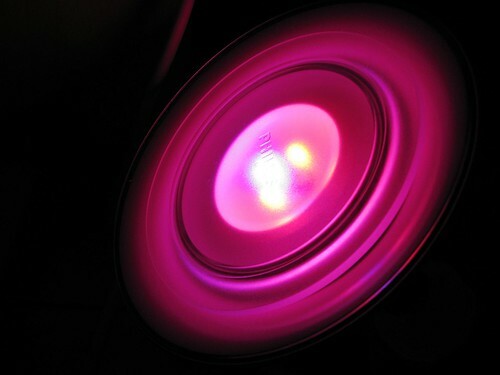 Using the dial, you can select from the 16 million colours that the LED lights can produce through mixing. Since they are based on LED technology, they use less energy and emits no heat so you can have it on for as long as you like. The remote will also allow you to change the intensity and brightness of the colours, so you can choose relaxing colours like pastel blues or intense orange for more passionate moments. It’s not just the colour that you can control. You can also change the intensity of the colour as well as saturation, allowing you full control over what colour is emitted. Holding the ‘on’ switch for about four seconds will put the light in to demo mode and fades through the different colours – not something you probably want running all the time but it’s a good way to see the vast range of colours available. 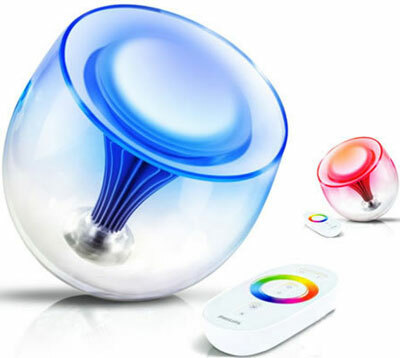 Philips LivingColor is designed to work on its own or alongside five other units and be operated from the same remote so that they change colour at the same time. 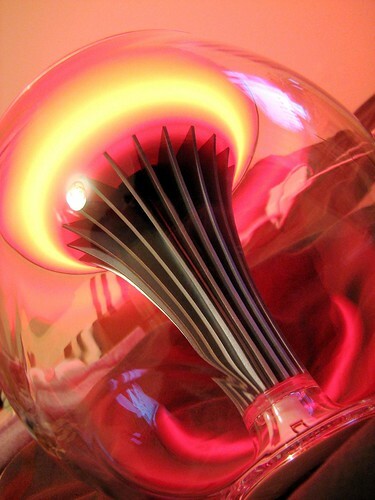 This would be ideal for ensuring the entire room is lit up with the mood light of your choice. Bold, beautiful and healthy. Those are the three words I would use to describe LivingColor. I love the entire idea behind this product because it does make a difference and it doesn’t pretend to be anything else other than to bring new shade of colours to your life. Whether it’s a measurable difference I couldn’t really say, but that’s not what this is about. It’s about the emotions that colour can bring out of you and the environment you live in and that in itself is a very powerful concept. Reminds me of those semi-transparent JBL speakers.